Julian Nacol was born in Dallas, Texas and graduated from high school at St. Mark’s School of Texas. Julian was a Prep All American Wrestler at St. Marks. After high school graduation, Julian joined the United States Navy and served his country in South East Asia for a period of 4 years. During his military tenure, Julian was stationed in Japan and served as an Aviation Technician, and a Plane Captain on the aircraft carriers USS Kitty Hawk and the USS George Washington. He was a member of the VFA-102 Diamond Back Squadron. Julian Nacol, upon completion of his Naval service, commenced his college career and graduated from the University of Texas at Austin in 2013 with a Bachelor of Arts degree in Philosophy and a Minor in English. Following graduation, Mr. Nacol immediately commenced his studies at Texas A&M School of Law and graduated with a Doctor of Jurisprudence in 2016. While at Texas A&M School of Law, Mr. Nacol served as president of the Federalist Society and interned with the Federal Public Defender Office in Ft. Worth, Texas. Julian Nacol was admitted to the practice of law in November 2016. 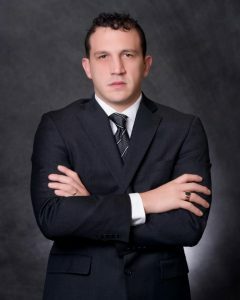 Julian Nacol joined The Nacol Law Firm in Richardson, Texas in May of 2016 after graduating from Texas A&M School of Law. Julian clerked with this firm during summer breaks during his tenure at the University of Texas. Julian was a court runner, paralegal, law clerk and now is an Associate Counsel of the Nacol Law Firm. J.D., 2016 Texas A&M College of Law, Ft. Worth, Texas. B.A. in Philosophy, 2013, University of Texas, Austin. If you think you may have a case, please call, or use our website form to contact us about your situation.